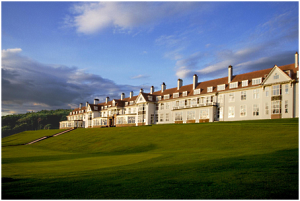 Turnberry has a long golfing heritage that all started back in 1901, when the first formal course was constructed. Since then its fairways have been shared by the game's elite and enthusiasts from all over the world. Turnberry is so important in the golfing world that it has held The Open Championship four times; most recently in 2009. The Turnberry resort in Southwest Scotland was originally constructed in 1906 and even served as an airbase during World War I. In fact the landing strip constructed at this time still exists. During this time the building that now houses a luxury hotel was used as a hospital, and performed the function of a hospital once again during World War II. In 1997 the hotel was bought by Starwood Hotels and Resorts Worldwide Inc. and operated under the Westin Brand until October 2008, at which point Leisurecorp, Dubai World's sport and leisure subsidiary, purchased the resort, with Starwood Hotels & Resorts continuing to manage operations under the The Luxury Collection brand. With the change of ownership, an extensive £30 million restoration began. Led by interior designer Mary Fox Linton, the renovation will return the 103-year-old hotel to the original vision of its architect, James Miller, keeping the red-roofed Turnberry Resort in its rightful place as one of the world's top hotels for years and years to come. Phase one of this extensive refurbishment targeted the public spaces, and selected bedrooms in order to open to the world's press and media in time for The Open 2009. 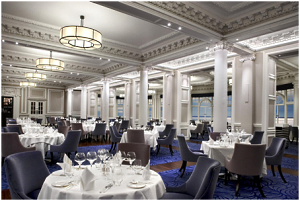 After successfully completing The Rutland Hotel in Edinburgh, based on a CUK Audio design, audio specialists Global Integrated Solutions turned to CUK Audio once again for a design to set their offering above that of the competition all trying to be involved in this prestigious installation. CUK Audio's Stuart Cunningham once again delivered a bespoke system designed around the functions needs of the client and the aesthetic considerations of the venue and Leisurecorp's interior designers. For the majority of the public spaces the ceiling construction made it impossible to use ceiling speakers, and the cable runs meant that 100V line was the only sensible option. Then, considering the multi-source / multi-zone audio distribution issues, a CobraNetTM network proved to be the right choice. The result was to utilise sixty-eight Audica Professional MICROpoint loudspeakers (with externally mounted 100V transformers) throughout the public spaces, where they blend seamlessly into the background and ornate cornicing. The ceiling construction in some of the meeting rooms allowed ceiling speakers to be deployed and, in this case, Community Cloud 6 ceiling speakers ceiling speakers were chosen. A CobraNetTM network provided the backbone of the audio distribution system, with a Biamp AudiaFlex CM (CobraNetTM Main Frame) performing the routing and matrix. To eliminate the need for Biamp input / output cards and to ease processing power in the Biamp unit, Media Technology Systems (MTSi) COM Series multi channel amplifiers where deployed. These amplifiers have internal DSP and allow their analogue inputs to be routed to their CobraNetTM port, thus removing the need for input cards on this particular processor or providing additional inputs with other CobraNetTM enabled systems. With 12 amplifier channels running all of the public spaces this provided 12 analogue inputs at the rack location. While MTSi ION 0.2 and 2.0 CobraNetTM wall panels were located throughout the building to provide local inputs and outputs all via CobraNetTM. Working in such an old building the system architecture and cabling had to be kept simple. The fact that the MTSi ION wall panels convert analogue audio to CobraNetTM, and vice versa on the wall panel and not via a remote rack mounted piece of equipment improved the cabling and system design significantly. The result is an advanced audio system that delivers on everything - most importantly audio quality and aesthetics.